The official citation said Manzano was honored "for his extraordinary picture, distributed by Agence France-Presse, of two Syrian rebel soldiers tensely guarding their position as beams of light stream through bullet holes in a nearby metal wall." 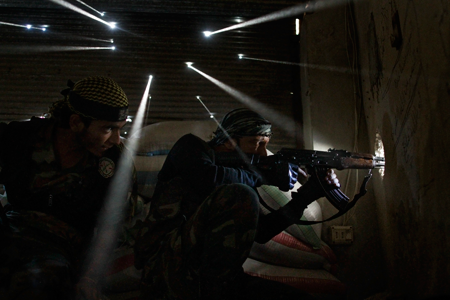 October 18, 2012 – Aleppo, Syria – Two Syrian rebels take up sniper positions in the heavily-contested neighbourhood of Karm al-Jabal in central Aleppo. Born in Mexico and currently based in Istanbul, Turkey, Manzano moved to the United States at the age of 18 and focused his work on cross-border issues between the country of his birth and the US, according to the Pulitzer citation. Working first as a photographer and video journalist for newspapers, he later added television and digital media. He worked for the Rocky Mountain News until that paper closed in 2009 and has since worked as a freelance photographer covering conflicts in Mexico, Afghanistan and Syria. The Pulitzer winning photograph was part of a series of photos taken by Manzano in Aleppo in October 2012 which were recognised in the 2012 World Press Photo awards.